Tohno Shiki hears of a new series of murders in Misaki similar to the ones that took place in Tsukihime. Whilst searching for the murderer he meets Sion Eltnam Atlasia who initiates a fight with him, attempting to capture him. After fight she reveals that her reason for attempting to capture him is to get in contact with the "True Ancestor" (referring to Arcueid) so that she may acquire information on the "cure for vampirism". Shiki then decides to help her with this task. 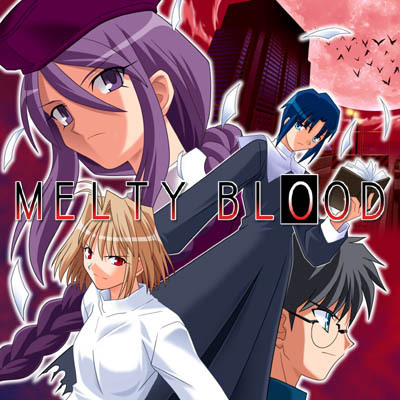 Melty Blood is a 2D fighting game. The first couple of PC releases had adventure style stories with branches and multiple number of endings and a secondary story in arcade mode. Later versions only have the arcade mode, but they have many more characters. The purpose of this guide is to basically give to give hints 'bout how to play, the route order n' such. ReAct is the only game with the Novel Campaing, and it's Arcade mode is the one with fewer characters. The story in the arcade mode changes depending on the game, so play all the main versions if you want to find out everything! I strongly advise that you played both Tsukihime & Kagetsu Tohya and also saw the Kara no Kyoukai movies so you can understand the relationships and motivations of the characters, since the game takes a lot from previous titles (SPECIALLY Actress Again). If you want to know the controls, use this link. There are 8 routes (not couting Bad Endings) divided in 15 scenarios (from A-O), route 7 (night ON THE BLOOD LIAR) is only unlocked by beating route 1-6, most consider this path as the "True" route and it is the one that ends in a more positive resolution. After beating all main 7 ends, you'll unlock a bonus "8" route that is an alternate end to path 7 (G.). Route 1 --> Route 2 --> Route 3 --> Route 4 --> Route 5 --> Route 6 --> Route 7 --> Route 8. NOTE: Failing battles doesn't mean a Game Over, it can send you to lower branches, while failing other fights means you'll get a Bad End. Running out of lifes will send you to scenario A, so exploit the "Return to Title Screen" (during the "Try Again?" screen) option to replenish lives. D. Win (If you already unlocked route 7, you'll have to Fail) OR Fail vs. Arcueid. G. Win vs. Nrvnqsr Chaos. Requires all of the above to be completed at least once. The path is very similar to Route 1. Requires all of the above to be beaten. The path is identical to Route 6. You can also end with one of the "Hero" characters if you want to leave on a better note. There are some extra characters like G-Akiha which doesn't have a story mode, and can only be unlocked by using cheat programs like art money. To reach the True End for each character you need to beat the arcade mode without dying! Highlight the "Arcade Mode" option at the menu, then hold D and press A to select it. The character selection screen background will turn blue to confirm correct code entry. The best times that G-Akiha has been defeated will also be posted on a screen. For a complete move list see this link. This walkthrough is based on info attained on Gamefaqs.com and the "Walkthrough.txt" that comes with the patch with some adjustments made by me. Neko-Arc Chaos can only be unlocked by beating at least one of the stories, he has two modes a "Normal mode" and a "Special Mode" (Hold Button D while selecting Neko-Arc Chaos till the story mode sequence opens. If Neko-Arc Chaos starts talking about something referring to HD DVD and Kohaku appears, you've got the right story arc. Your mid-boss will be 4 Neko-Arc Chaos & final boss will be Neko Chaos Black G666 instead of Satsuki & White Ren). To unlock Giant Attack 666 Mode, you must beat arcade mode with Neko-Arc Chaos while doing his special story mode. This walkthrough is based on info attained on Gamefaqs.com (1/2) and with some adjustments made by me. A year has passed after the TATARI incident left Misaki Town scarred. However, the nightmare revisits again for the third time. I personally recommend following the order listed on this playlist. If you want a achievement guide see. Boss Rush mode is only available at the Ps2 version, so if you're only interested in the story see this video.